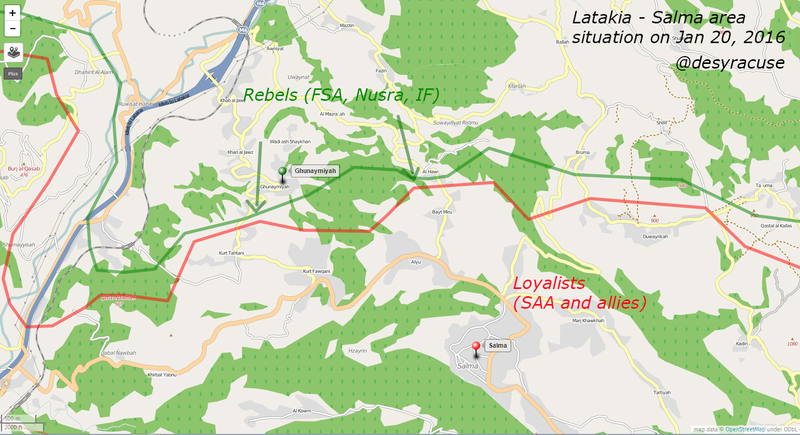 Following Salma capture on Jan 12, 2016, loyalist forces have gained control of several villages around and North of the former rebel stronghold, raising concern among rebels of how long they could maintain a presence in Latakia government. On January 18 however, the rebels regained control of Ta’uma near Duwayrikah, and on January 20 they launched a counter-offensive on Wadi Shaykhan, Ghunaymiyah and Al Hawr, taking control of those villages in the early morning hours. This entry was tagged map, Salma. Bookmark the permalink.